This hillside village, which overlooks the Aracena reservoir, has been declared of historic-artistic interest due to its well-conserved examples of traditional local architecture, typical of the hill towns of Huelva province. It is worth making the climb up the steep, winding streets to the top of the town - follow signs to the mirador (view point) and plaza de toros (bullring). You will go past Plaza de la Concepcion, the town square, and the tiny Ayuntamiento (town hall) building. 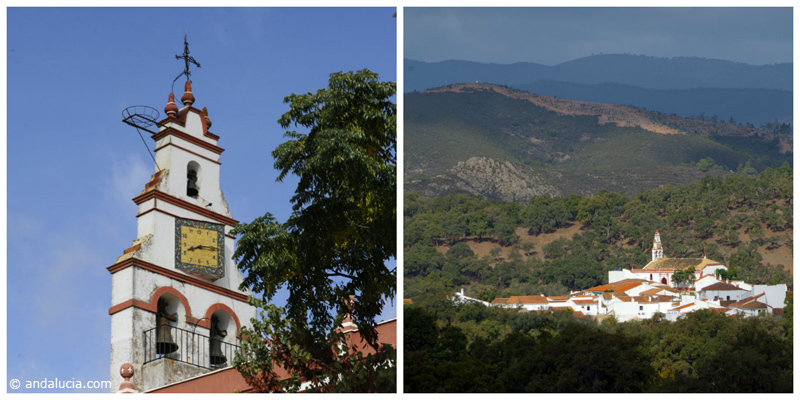 In this upper part of the town, you will find the most interesting buildings of Corteconcepcion - its church and bullring. The village church, Nuestra Señora de la Concepción. The delightful pink-and-white Our Lady of Conception church dates from the mid-16th century and has an ornate Gothic-mudejar tower. Inside, it has three naves and a Gothic transept; the façade was restored in 1920. At the back of the church is a mirador which offers views over the Aracena reservoir and the village bullring below. 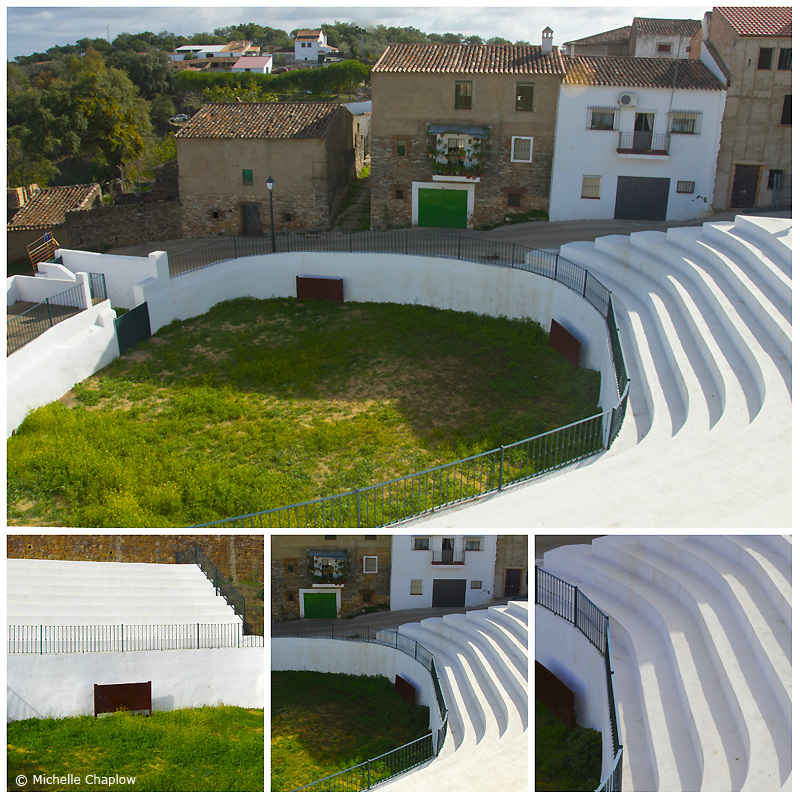 Unusual bullring, complete with wild flowers and local dwellings with a bird´s eye view. Typical signs of traditional, rural life include communal washing sinks and, of course, no town is complete without its plaza de toros (bullring). This particular one, located near the church at the top of the village, is unusual in that it is not a perfect circle as it is cut out of the grassy hillside, and even has wild flowers growing out of some seats. The bullring is backed by pretty stone houses, making it one of the most picturesque in the area. A tip - if it´s not open, you can get a good view into it from the church car park. The village is ideal for hikers, due to its location in the Parque Natural Sierra de Aracena y Picos de Aroche - one of the main hiking routes in the area goes from Aracena itself to Corteconcepcion. In terms of gastronomy, the much-prized pata negra (black foot) pigs, which produce the best jamon (ham) are raised in the village - you can see some of them in a smallholding near the bullring. At the other end of the process, there are also fabricas de jamon (ham factories) in the village, so you can buy ham here that is genuinely local. As well as the pork products, traditional dishes include garlic soup and piñonate, a pine-nut sweet. Local handicrafts include cork and wood products. Its main fiestas are San Juan, on 24 June, with religious procession, dancing and hogueras (bonfires), the August Fiesta, in the second week, with dancing, sporting and cultural events, and ham tastings. Unusually, Corpus Christi, usually celebrated at the end of May/beginning of June, takes place on the first Sunday of September in Corteconcepcion. 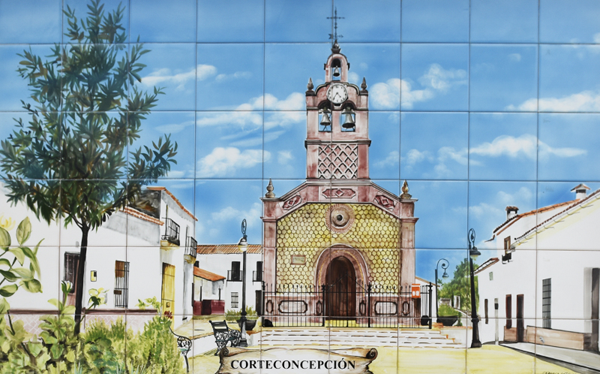 Corteconcepcion, which consists of two areas, La Corte and Puerto Gil, is 110km north-east of Huelva. To get there, take the A49, leave at exit 75 heading towards Trigueros. 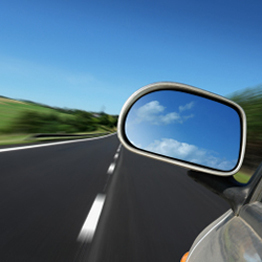 Then take the N435, the A461 and finally the N433. Hover the cursor over Corteconcepcion to see bigger map and click to go to the maps page.